Cells communicate with many varied signals—both chemical and electrical. Signals can be secreted in the space between cells, into the blood stream and in cerebrospinal fluid. Chemical signals can be sent in small vesicles (endosomes) or in nanotubes that exist between most cells. Another way that cells talk is by forming a physical connection between two cells. Physical synapses are often very elaborate with multiple molecules from each cell joining hands to keep the connection close. Very recent research shows that in neuronal synapses these connecting molecules are very elaborate spreading across the gap and making sure that the release of chemicals is exactly near the receptors. Some synapses last for years, while others can last for days, hours or brief moments. By being in close contact, many interactions can occur rapidly. Synapses between neurons in circuits are well known and use either special chemicals (neurotransmitters) or direct bilateral electrical current (electrical gap junctions). Each neuronal synapse includes an astrocyte wrapping around the entire connection that monitors and contributes to activity. Neurons also engage in larger multi cell synapses including glial cells and immune cells related to chronic pain and inflammation. Communication by cells touching occurs elsewhere. Microglia tap each part of their territory to find out what is occurring and respond sometimes by eating the synapse (pruning). Cells make contact with each other as a form of communication to exchange information molecules. Immune cells engage in a different type of synapse. Immune synapses are often brief. Dendritic cells make contact with T cells for decision-making related to activation of the T cell. 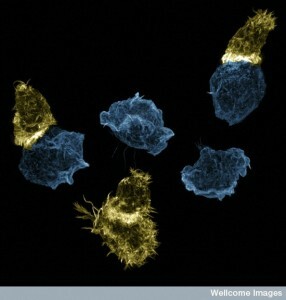 Dendritic cells bring material they have picked up and present it to T cells. While connected, the two cells together make the decision whether to activate the T cell or not. Another synapse occurs between T cells and B-lymphocytes that form connections so that T cells can help make better antibodies. Immune synapses that T cells make when it becomes a killer cell are different. New research shows details of the T cell cytotoxic synapse. It is a complex connection that occurs rapidly with devastating consequences for the infected cell. This synapse uses spindles that are similar to cell division and to the primary cilium. The primary cilium was discussed in a previous post. It is an organelle in most cells used for communication with other cells. Primary cilia are elaborate antennae and signaling centers and could be the brains of the cell. T cells activate to become killer cells and then attack infected cells and cancer with remarkable ferocity. Please see other posts for a summary of the remarkable lifestyle of T cells. This includes an ability to dramatically change its metabolism in many ways to alter its shape, speed of reproduction and ability to survive in any environment, even without oxygen. A major T cell tactic is direct contact with an offending cell by forming a synapse between the two cells. This immune synapse is sometimes called a cytolytic synapse, meaning killing of a cell. 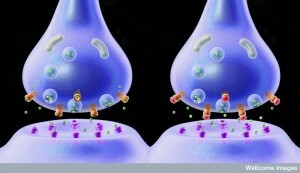 Mechanisms at this synapse are very complex and involve rapid elaborate remodeling of the scaffolding inside the cell. Despite very brief contact, microtubules and actin in both cells undergo many different alterations. Structures are built with scaffolding molecules to rapidly form a temporary connection and then a very secure connection that allows multiple rapid actions. In fact, unlike other types of synapses, centrosomes are brought right up to the membrane to direct the action. Centrosomes are vital structures that coordinate all microtubule structures as well as the spindles in cell division. 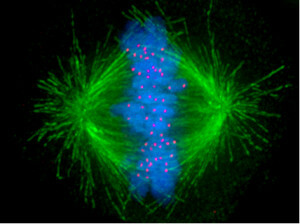 Centrosomes are known to coordinate complex activity such as cell division, where they drag two sets of chromosomes in different directions to form two daughter cells. Centrosomes are also used to build and coordinate the microtubule highways that provide very elaborate transport along the long neuronal axon. (See post on axon transport systems). The only other time that a centrosome is directly at a cell’s surface is when cilia are formed. Cilia provide both movement and the extremely elaborate signaling machine called the primary cilium. Cilia line many organs where fluid must travel, such as the secretions in the lung and the cerebrospinal fluid in the brain. Killer T cells come from CD8+ T cells, which are originally small and quiet cells that travel about looking for problems. When they see a problem molecule in the groove on the surface of the presenting cell, they stop at the cell. This molecule from inside the cell is placed in the groove so the T cell will know if the cell is normal or infected. 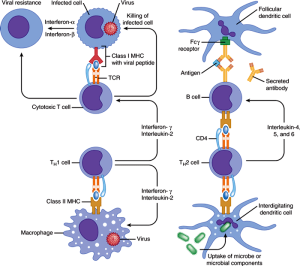 It is called a MHC or major histocompatibility antigen – see post on T cells. If it is abnormal or infected it the molecule integrin is stimulated to stick out from the T cells to grab onto the other cell. Activation produces a dramatic change in the status of the T cell that produces an army of killer cells over several days with many granules filled with molecules that are weapons. Some of these granule toxins cut holes in cells (perforin) and some (granzymes) cut proteins in cells leading to cell death. 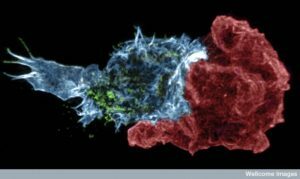 Killer cells become much bigger and develop a very complex internal architecture with scaffolding molecules. Upon activation, a large activation cluster is formed right at the synapse, called central cSMAC (or supra molecular activation cluster). This cluster includes many special receptor molecules and a complex large machine called the microtubule-organizing center (or MTOC). MTOC is a type of centrosome where the minus ends of microtubules are anchored and from which the plus ends of microtubules extend. Cells can contain multiple MTOCs wherever microtubules are being used. Another cluster is formed called distal dSMAC, which is away from the synapse at the back of the cell. These two clusters work together in the processes that occur. The synapse first forms in the CD8 T cell and then is altered as the cell becomes a cytotoxic killer cell. At first it helps with the changeover to killer cells. In the killer cell, it is prepared to send the attack granules within minutes. Previous research developed a timetable for formation of the immune synapse that was recently updated. Earlier research showed that right away, within ten minutes, T cells have inter digitated contact between the two cells made of actin molecules. These are like interlocking fingers. Within an hour, large tight connections of the two cell membranes are built with less actin across the synapse. 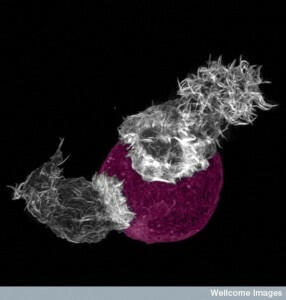 T cell receptor molecules themselves form a cluster that starts the cSMAC. When the bigger more secure contact is rapidly built, microtubules and dynein motors become very active. Actin seems to help the receptors coalesce at the beginning, but then microtubules in the center become prominent, directed by the system of centrosomes. A particular adaptor protein calls for dynein motors. Dynein is also involved in bringing vesicles to the synapse to be sent into the cell to be killed. 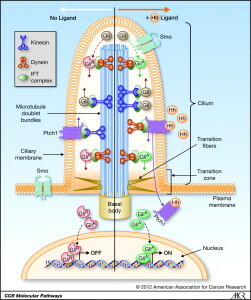 Receptors travel in vesicles. Recent advanced imaging now shows the order of events are actin remodeling at the site, building complexes, altering the centrosome to face the synapse (polarization) and then shooting in the granule weapons. In twenty seconds actin moves in, within a minute actin moves back as the membranes form the very tight contact. Receptors then form clusters as the membrane tightens and the central SMAC occurs within 2 minutes. Within two minutes the centrosome is directing microtubules while moving from a distant location. It arrives at the synapse in six minutes. 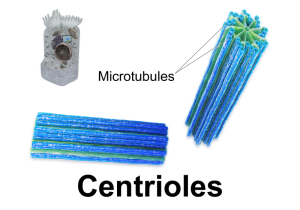 This moving centriole brings vesicles filled with receptor molecules and many granules. Granules are released which kills the other cell. Two waves bring receptors and granules, one immediately with actin and the second with the centriole. Actin arrives almost immediately and then recedes continually to the back of the cell away from the synapse. This occurs when the protrusions and inter digitations disappear to form the flat connection of the membrane. Actin flows at the beginning and later provides mechanical force for the connection. The first contacts are actin protrusions that grab the other cell. Actin fingers both cause adhesion and are vital for signals. Several organelles, as well as the centrioles, have to rapidly move and re organize. The secretory organelles are needed for the rapid flow of vesicles filled with weapons and receptors. The centrosome has to change direction and focus on the synapse, called polarization. As with everything else, there is a large multi protein complex that regulates cell polarity that is involved (PAR polarity complex or partitioning defective polarity complex). This occurs with a lot of signaling in complex cascades of molecules. Dynein motors are placed at the synapse and they pull the centrosome into place. At the same time, Myosin II motors push from the other side. 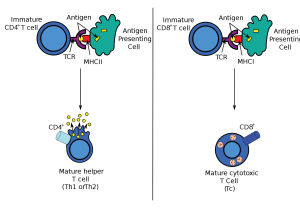 Many different proteins move the centrosome from the rear of the moving T cell to the front synapse position. In fibroblast cells centrosomes position themselves in the direction of healing. 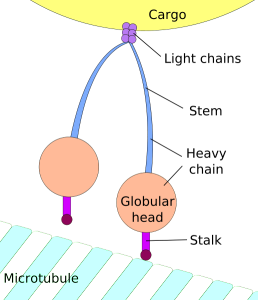 The position is determined by the pointing of the minus end of the microtubule. Another force is the first of the microtubules that goes from the centrosome to the membrane at the synapse using dynein motors. Microtubules actively shorten themselves to pull it in. All of these mechanisms work together. This movement occurs in two steps with two mechanisms, the first faster, then slower at it hooks to the membrane. There are other immune fighting cells that also have different types of immune synapses, but there has been little research until now. They appear to be simpler than the T cell killer cells. Many signals in the natural killer cells work to move the centrosome. There is some variation between different kinds of killer cells. Cytotoxic T cells have these complex mechanisms as the T cell shifts into gear. 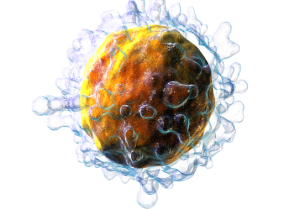 Natural killer cells, another type of immune cells has somewhat simpler mechanisms. A previous post discussed the little known, but incredibly important primary cilium. This very complex organelle exists in almost all cells and in some, such as in the eye and ear, it becomes a large primary sensory organ. But, in almost cells including most immune cells and brain cells, it is a center of signaling with many receptors and many mechanisms to translate signals into cellular actions. What is unusual is that lymphocytes are one of the only cells that don’t make a primary cilium. Perhaps this is because they have so many other unique talents. But, now that the immune synapses is being described, it appears that the immune synapse might be their variant primary cilium. Some have considered primary cilium as vestigial, but more likely they are the brains of many cells, certainly the signaling center. There are some striking similarities between the immune synapse and the primary cilium. See the post on primary cilia for the description of the extreme complexity in the structures and functions of cilia. In most cells centrosomes only contact cellular membrane when making a cilium. Choroid cells in the brain direct currents of signals with moving cilia. They are used in the lung to help move secretions. Free ranging cells navigate with them. In immune synapses, electron micrographs show great similarities with cilia. They both contact the membrane with the Golgi in position to provide vesicles. Both immune synapses and primary cilium have membrane-focused centrosomes. Both have less actin around the periphery of the membrane (called cortical actin). In both, the section of membrane that has the necessary enzymes for the synapse is marked by an actin ring. The post on the primary cilium described a very complex transport system for proteins, receptors and other signal molecules. It is an elaborate elevator type mechanism, called intra flagellar transport system or IFT. These proteins have been found in CD4 T cells without apparent purpose. Several of these proteins control signals from receptors at the synapse. There are a variety of other molecules that are similar for the vesicles. Both have special calcium signaling channels. A primary cellular signaling pathway called Hedghog (Hh) operates in both. 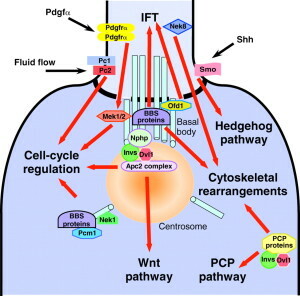 This Hedgehog pathway is highly involved in development of the embryo. It signals for more cells, and signals for differentiation into particular cells. Its messages are also related to the structure of tissues and maintenance of tissues. 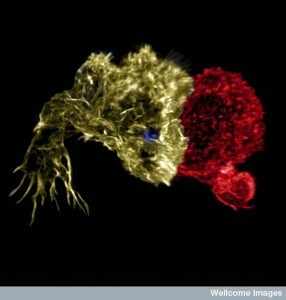 In killer cells, this Hh signaling is related to the ability to kill other cells. It controls actin movements. The Hh signal in CD4 cells is between two cells, but in the CD8 cells that become T cell killer cells with an immune synapse, signaling is inside the cell only. This means that the when the killer cell is focused on the synapse and killing the cell it would be responding to Hh signals from the outside. The centrosome’s connection to the membrane is not entirely clear and is very complex. Cilia are stable and are used for a period of time. Immune synapses only exist for the moment of the kill, usually several minutes. The connection has to be mobile and transient, not stable. One theory is that centrosomes put out microtubule highways that transport granules across the gap of the centrosome and the secretion from the membrane. In cilia, centrosomes are made up of two centrioles and other matrix around it. It has two clusters at two distances from the cilia. The closest one to the membrane called the basal body connects with the cell’s membrane. This mechanism is also noted in the immune synapse, where microtubules came out of the appendage of the centriole propelling granules. 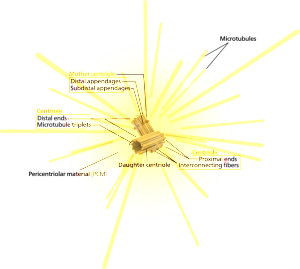 In the other killer cell with rapid reproduction, in fact there are many centrioles, but only certain ones are active at the synapse. 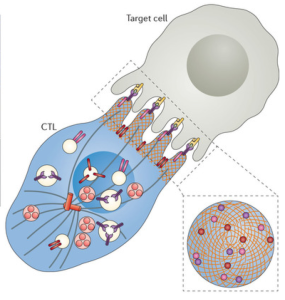 Another distinction between T cell cytotoxic killer cells and natural killer cells is that the protein that connects the cilia stays attached to the centriole and doesn’t make a firm connection. Other immune cells that make connections with cells have a similar mechanism to the simpler natural killer cell. This includes dendritic cells that connect to activate T cells, CD4 T cells, B-lymphocytes and natural killer cells. The detailed mechanisms of these cells have not yet been studied. The very talented see posts) is able to rapidly produce a devastating army of cells that form an aggressive rapid synapse connection to cancer cells and cells infected by viruses and other microbes. The remarkable cytotoxic immune synapse is very complex, but the many steps occur rapidly within minutes. Several lines of research converge in uncovering the complexity of the immune synapse. The primary cilium and the vital spindle that orchestrates cell division (sometimes called the most complex mechanism in nature) are very similar in many ways to the immune synapse. It is another example of a vastly complex rapid mechanism that occurs without clear direction. Some have speculated that microtubules form a quantum computer that directs cellular activity. While there is no proof of this, it is interesting that many extremely important and vastly complex activities use microtubule machines, centrosomes and spindles. This includes transport along the axon, spindles for cell division, primary cilium and moving cilia. There is no doubt that microtubules appear to operate as an intelligent LEGO like system vital to the life of many cells. This entry was posted in Blog, Neuronal Plasticity, Cellular Intelligence and tagged cytotoxic immune synapse similar to primary cilium, cytotoxic immune synapse uses centrioles as in the spindle of cell division, Cytotoxic immune synapses has many rapid steps. Bookmark the permalink. Dear Dr. Leff, just wanted to tell you that I have been reading your posts with great interest – you do a wonderful job at revealing the beauty and complexity of the body in clear terms. Sending you applause and appreciation! Thank you.